Have you wondered what ships are made of and what are its parts? Well, you are not alone; it is this curiosity to know about ships lead me to pursue my career as a marine engineer. Chances are, you have watched a film related to ship or want to pursue career in navy; wondering how are they structured and what are their parts called ! While a ship may be of many types from small to large and merchant to military; they all have two points in common. One they are made of steel and composite material and second; they all have three main parts i.e Navigation bridge, hull and Engine room. You can learn more about different types of ships based upon their size and use on our earlier post; “Types of Ships and What Do They Do ? “. A ship has both visible and invisible but structural parts. While common visible parts of a ship are; rudder, anchor, bow, keel, accommodation, propeller, mast, bridge, hatch coves and bow thrusters. On other hand invisible but structural part of ship consists of; bulkheads, frames, cargo holds, hopper tank, double bottom, girders, cofferdams, side shell etc. 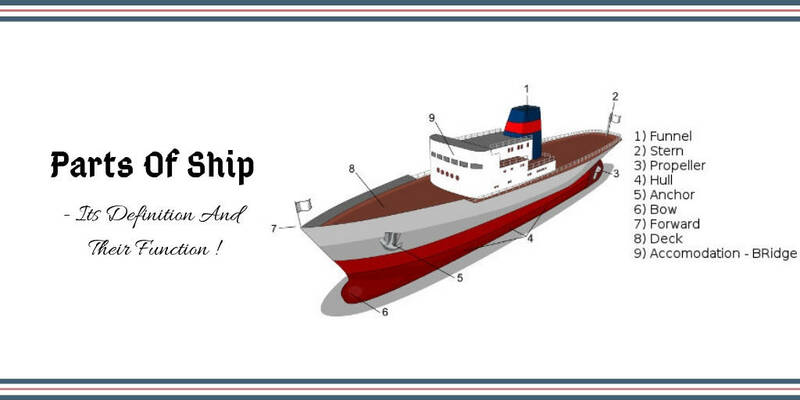 Understanding ship construction is hard and uneasy with common terms such as front, left, right and back; so we will look into some of the common nautical terms used on ship. For a person facing bow ( The most forward part of the ship ) for a moving ship; the side to his left hand is called port while on his right is called starboard. Similarly; the side to his front is forward and that to his back is called astern. Since we have gone through a transformation from floating vessel to large ships; we will learn about parts of ship that is common to all. An anchor is a heavy metal piece attached to the chain cables and is stored or secured in the hose pipe during the voyage / ship operation. It can be either permanent or temporary with an additional sub class of sea anchors. All ships carrying anchors are of the temporary type; as they are not always fixed to the same position and often lowered at different position depending upon need. Together with its chain cables, connecting devices, windlass and chain stopper it is called anchor gear. An anchor is made of five major parts; shank, crown, stock, flute and tripping ring. A shank is a fixed stem structure which is fitted together with flute by the tripping pin passing through the shank hole. Together; these connecting structures along with stack ( A crossbar that helps turn the anchor to assist flute to dig into ground ) are known as anchor crown. 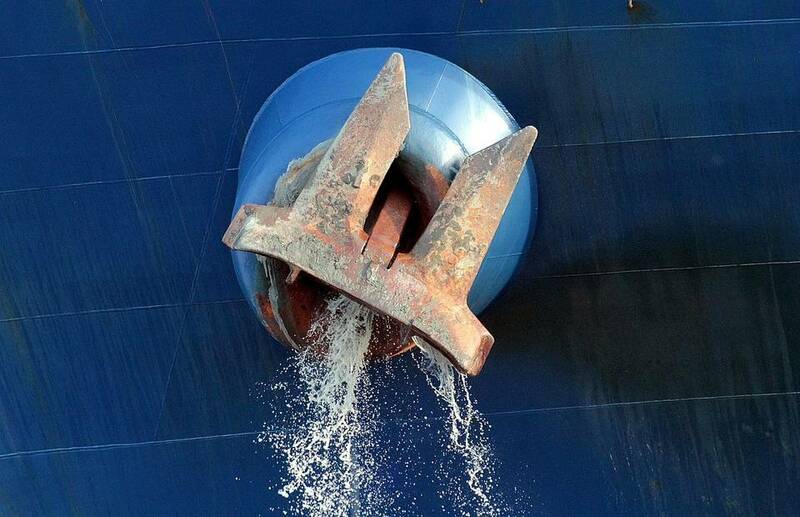 The fluke on respect is the key part of an anchor which actually dig deep into the ground to hold the ship in place. Function: While most ships move from port to port; many have to wait outside for the berth. With increased shipping over times and growing number of ships it become more and more common to wait for long for berth. So to secure them in place against the natural forces such as wind and tide current; anchor are used in ship. They acts as a holding hand securing them to a definite place with their flute hooked deep into sea bed and weight of chain along with its resultant force keeping the ship fixed to its place. 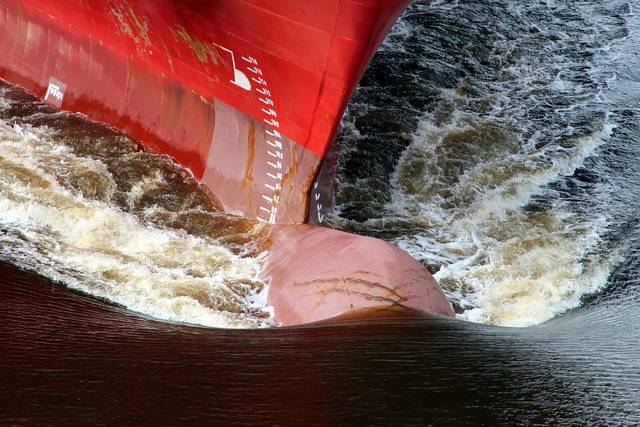 See the budging shape of the bulbous bow that effectively cuts the water as the ship proceeds. A bow is the front most part of a ship which cuts the water along its sides as the ship proceeds. The key two requirement for a bow is to have; minimum drag possible or so called resistance between the water and the ships hull and must be tall enough to avoid water splashing to easily on top of it. In all the different bow types tested so far in the history only a handful of them pass the test of time; bulbous bow, Inverted bow and an Axe bow. A bulbous bow is the one that you will see in most ships including that used for commercial shipping. It can be identified easily by its distinct bulging bulb like shape just under the waterline; and has an advantage of increased fuel efficiency of a ship by 10 to 15 percent. On another hand a ship with inverted bow design have its part of hull and bow; upside down much like that of a submarine with extended waterline. This on one hand improve its water drag while on another restricts its reserve buoyancy and speed in bad weather. Such a bow type is usually used for ships involved in anchor handling, laying deep sea pipes and offshore. An Axe bow type have a vertically stem line hull structure; along with a deep Axe like structure in the foremost part of the ship. It is one of the parts of ship which due to its design capabilities; helps improve the speed of ship for same power. Function: Have you feel that extra effort you have to make to walk through water? That is due to water drag and its resistance to your body motion. So to reduce similar negative forces on ships body; bow are placed on ship assisting easy propulsion. A bow thruster is a propeller like device fitted on both side of ships bow. It is used to increase the maneuverability of a ship in congested waters under very slow speed like that in canals or near ports. For most designs you will only found a tunnel passing through ships bow with an impeller in place. It is for this distinct look; bow thrusters are also referred to as tunnel thrusters. The impeller can rotate in both direction; clockwise and anticlockwise generating bidirectional thrust capabilities. Having bow thrusters greatly affects the overall running cost of a ship by reducing part of port cost for tug ( A small boat used by port authorities to help safely dock a ship ) assistance. For ships having bow thrusters it is required to have proper markings on both sides above waterline. These thrusters are mostly powered electrically using a prime mover attached to the impeller shaft using a bevel gear assembly. For some ships they are also powered hydraulically where electrical option is not possible or is unfeasible. Function: A ship is maneuvered using propulsion and rudder angle variation. A rudder is a blade like structure situated at aft of propeller which moves horizontally across the medium to steer a ship. Rudder angle is changed by a value to get desired change in ship direction. But what if the speed of ship is too slow to be effectively controlled by rudder angle? This is where the bow thrusters came into picture assisting captain to steer ship even at very low speed. It is a place on ship where the crew resides or live. Together with offices, crew cabins, gym, prayer room ( Few ships ), salon, recreation room, laundry, hospital and galley it is the heart of a ship next to engine room and bridge. A salon on board is the common area or living space for its crew, passengers and any visiting authorities to interact; and often include common room and dinning space. On another hand galley is just a nautical term for kitchen; where food is prepared. Being one of the key parts of ship; accommodation accounts for major systems on board including; fresh water system, refrigeration system ( domestic ), garbage disposal system, sewage treatment plant and air conditioning for accommodation block. 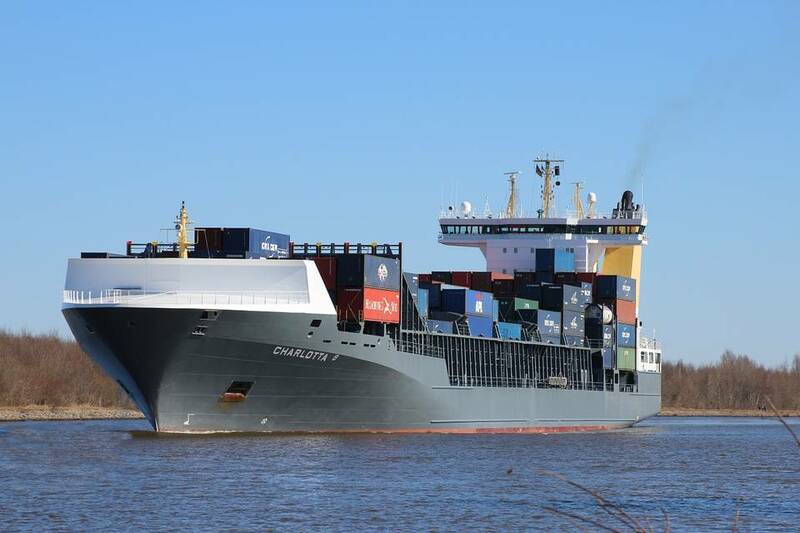 Under international and local maritime laws of flag state it is required to have accommodation of all vessels including; passenger ship, cargo ship, salvage ship, tug and dredger above the summer load line situated aft or amidships of the ship structure. Function: An accommodation accounts for the living space of the ship. Under maritime labor convention ( MLC 2006-2007 ); it is required by law to provide adequate accommodation facilities to ships crew and officers along with proper recreational facilities. In this it is stated to have proper provision for safety, accommodation, health and accidents of crew on board ship. It is now required to have hospital accommodation, proper ventilation, lighting, head space, heating with adequate size of crew cabins. A deck is a floor or covering to the ships hull structure. A ship can have different decks at different section or parts of ship; namely upper and lower deck or deck 1, deck 2 and deck 3 in a sequential downward way. What it means is that; the topmost deck exposed to weather is called main deck or weather deck. The levels and floors below weather deck is called deck 1, while one below deck 1 is called deck 2 and so on. On other hand decks or floors that does not extends from aft to forward are generally called as level. 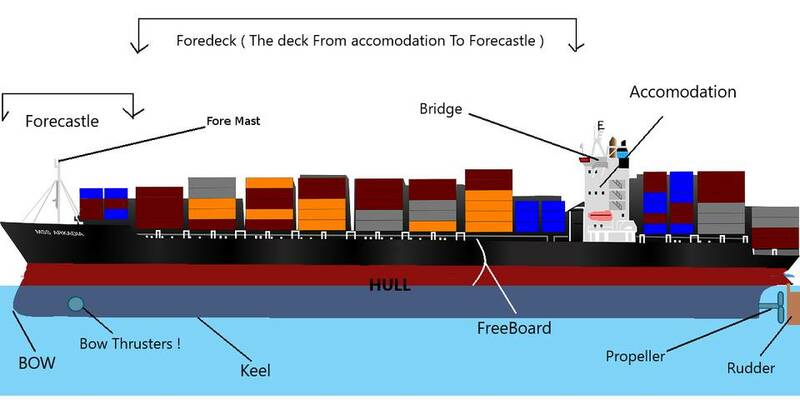 Based on the position and level a ship’s deck can be divided into six main types; main deck, poop deck, upper deck, lower deck, weather deck and Foredeck. The main deck on the ship which run through its entire length is called main deck. For most ships it also the top most deck and so also called the upper deck; but in war ships its a separate deck below the upper deck. The deck below upper deck is called lower deck while any part of ship which is exposed to open weather is called whether deck. The deck situated in the aft side of a ship is called poop deck; while the part of deck situated in between accommodation and forecastle is called fore deck. Function: One of many parts of ship; a deck is the plane that holds the hull structure providing different celling floor to the ship. The other job it do is to provide space and floor for the equipment and people to stand and work while protecting them from outside weather. An anchor secured in the hawse pipe in hull structure. A hull is that part of ship that extends below the waterline to cover and protect water from getting in. You can consider it as the shell which protects the inside treasures from outside environment. Everything that is stored and situated within the main ship structure is covered and protected by the ships hull. It includes the key parts of the ship such as bow, deck, the bottom keel and the both sides of the ship. They are made up of series of plates jointed together called stakes along with other structural member such as plating and stiffeners. A stiffener consists of structural parts such as longitudinal and transverse frames, bulkhead stiffness, girders and beam. While ships plating consists mainly of deck platting along with bottom, bulkhead and side platting. Ships hull are designed as such to offer minimum resistance to water, is feasible and economical to construct without losing on much needed cargo space. One can easily calculate and improve the overall efficiency of a ship calculating and reducing hull’s resistance to ships motion. Function: Made of steel the key role of ships hull is to maintain its water tight integrity and reduce water drag. And so hull plays a major role in determining overall efficiency of a ship. Ships hull are thus coated with special paints that not only reduce frictional drag but also avoid marine growth which further increase the resistance to ships motion. Thus ships hull are cleaned and repainted with special coating during dry dock operation. A keel is a part of ships hull that is responsible for providing strength to the ships structure; spreading stress and load equally along its longitudinal sides. Due to its this property to hold and support ship structure it is often termed as the backbone of the ship. In simple terms it provide stability to a ship and increase its effective speed. The introduction of keel in shipping reduce much of the work regarding stabilizing ship structure. It was first known to be used by vikings to reduce lateral movement of their boats at the time. A keel is nothing but a thick plate that runs longitudinal across the ship from stern to stern; passing through the centerline of ships bottom structure. There are three main types of keels used in marine industry; flat keel, duct keel and bar keel. A flat keel is used in all major ships in operation; bar keels are used when the ship has to work in shallow water while duct keels are preferred for offshore vessels and double hull tankers. Function: Being one of the key parts of ship; it helps stabilize and support ship structure. It also plays an important role increasing the effective speed of a ship. With displacement of ship dependent upon the depth of keel from water line; it is helpful to measure draft and reserve buoyancy of ship. A freeboard stands for the part of ships hull located above the waterline. It is the distance between the upper deck of ship and the point of waterline. The freeboard of a ship is not fixed but rather depends on the amount of cargo it carries. It is required at all times to maintain a minimum freeboard at all times to avoid ship from sinking. Thus to ensure safety of ships at sea; load line marking is used to ensure maximum possible draft for safe voyage. The distance between the upper deck and the load line accounts for the minimum freeboard of a ship. Under international convention on load line ( ICLL 1966 ); it is required by law to maintain a minimum freeboard at all times. This puts a cap on the amount of cargo a ship can load. By law it is required by ships to load only up to the load line marking for the designated water type. Thus it is a must for ships to have proper load line marking amidships on either side of the ships hull. Function: The role of freeboard among different parts of ship is to maintain ships stability and avoid it from sinking. Under ICLL 1996 ( International convention on load line ) following load line marking are put on ships hull; Tropical Freshwater, Freshwater, Tropical, Summer, Winter and Winter North Atlantic. These load lines ensure that the ship have minimum sufficient freeboard at all times for safe voyage. An engine room is the power house of the ship located in the lowest most deck on aft of the ship. It contains important machinery such as main engine, auxiliary engine ( Alternator ), shafting, boiler, fresh water generator, air compressor, calorifier, purifier, incinerator, pumps, heat exchangers, workshop machineries etc. If you ask a mariner about engine room the first thing he might tell; its hot, noisy and full of vibration. The average temperature of engine room is always above 45 degree centigrade. All the machinery in engine room is well segregated across different places on three different decks named utility deck, weather deck and machinery deck. With all the propulsion and auxiliary machinery installed in place it is also called as the heart of the ship. All the machinery in engine can be controlled from a control room called Engine control Room or ECR in short. It is the only place in engine room where you will get relief from hot temperature and much of the noise. Function: The key role of engine room is to hold all the key machinery and auxiliaries required for different operations on board ship. On deck one it usually has control panels for diesel generators and pump, workshop, store room, settling tanks, service tanks, fresh water expansion tanks, Inert gas platform, deck air compressor, air bottles etc. On deck two it contains; Fuel oil heaters, purifiers, boilers, main air compressor, diesel generators, fresh water generator etc. While the deck 3 mainly consist of main engine, different supporting coolers, oily water separators etc. A funnel is what from which the exhaust gases are released into atmosphere. You can consider it as the chimney of the ship. Since the introduction of mechanized ship; it has been an integral part of the ships structure. The cross section or width of these funnel largely depends on the amount of exhaust engine room produce. In early days of shipping it was used to release everything that the ship emits; but nowadays it is used within the limits of controlled emission with shoot collection in place to reduce pollution. All the shoot that is collected in the shoot collection tank is then later discharged to the port authorities. If not possible they are discharged overboard via an eductor recording the time and amount in garbage record book. If you look up-close carefully; will find that these funnels are in fact not that straight but inclined to an angle. This is done deliberately to assist the flow of flue gas away from the navigation bridge and ships deck. Function: Being one of the parts of ship the function of a funnel is to safely release exhaust gas produced in engine room to the outside atmosphere. Together with the forward motion of the ship and funnel inclination towards the aft; exhaust gas is easily moved away from ship avoiding possible hindrance to ship navigation. Build Upon The Original Image Picture1 and Picture2 From IMO shared Under Creative Commons 2.0 License. If engine room is the heart of the ship; navigation bridge is its brain. It is an wide platform on top of the accommodation from which the ship is controlled. They are many a times aided with additional narrow passage called bridge wing; to allow broader and better view of the outside to safely maneuver the ship. The main part of the bridge from which the ship is controlled and steered is called pilot house. According to the maritime rules and regulation it should be constructed such that; it provide a clear view from 1200 port to 1200 starboard from conning position. It is the position in the navigation bridge from which the duty officer command, monitor and maneuver a ship. Under normal condition an able seaman is present with duty officer in the navigation bridge. Under dangerous maneuvers or near port; captain is present in the navigation room with assisting duty officer, able seaman and a pilot ( If provided ). A ships bridge is equipped with equipments including; gyroscope, radar, magnetic compass, auto pilot, sonar, rudder angle indicator, G.P.S, ships horn, navigation lights, signaling flags etc. Function: Out of various parts of ship; the function of navigation bridge is to provide ample space for officers to look out and maneuver safely. It also holds necessary equipments and controls to change ships speed and its direction while monitoring outside sea condition and establishing proper means of communication. A forecastle is the foremost parts of ship. It accounts for the front part of the ships upper deck and is not more than 7% of total deck length. It can be easily identified on a ship structure by a sudden rise in the fore deck near the ships bow. In earlier days forecastle of a ship was used for a specific purpose of taking defensive positions by the soldier in the military vessel. These days it is used most for holding and securings major ships parts. It is the hose for anchoring tools and ground tackles with parts including but not limited to; windlass, haws pipe, anchor chain, chain block, open rail, deck flange, gear box, hydraulic motor, anchor, bollard and foremast. It is the part most used for anchoring operation and checking or maintaining navigation lights on foremast. Function: Being one of the key structural parts of ship; a forecastle or the foremost part of the fore deck it hold all the necessary equipments required for anchoring operation. On navy ships apart from holding anchoring tools and equipment a forecastle also holds strategic defensive guns position. It is a fan like mechanical device with blades fitted on the shaft. It rotates with the shaft to produce much needed thrust to propel a ship. The propeller of a ship produce this thrust by converting the rotational energy of its blades to pressure energy. This is done by using the difference in pressure generated on its near and far side of the blade to push the water aside. Together with its parts; hub, blades and its faces it produce the required thrust for propulsion using newtons third law of motion. Newtons third law of motion states that; for every action there is an equal and opposite reaction. The propeller of the ship push the water backwards creating a net resultant force of equal magnitude that makes the ship move forward. A propeller is a part of ship propulsion system which includes; engine its shafts ( including intermediate & propeller shaft ) and propeller. Being one of the vital parts of ship; a propeller is made of non corrosive alloys such as aluminum and manganese bronze. Function: A ship would be useless if it does not move; so propellers are installed on ship to provide it a forward motion. So the function of propeller in ship is to provide much needed thrust to propel the ship. A propeller can be divided in four main types based on its number of blades; while of two main types based on its pitch. Based upon its pitch a propeller can be of either fixed pitch propeller or controllable pitch propeller. Similarly based upon number of its blades; it can be of three blade, four blade, five or six blade type. If propeller is the parts of ship that propels then rudder is the one that makes it steer. Situated in the aft of propeller; it is a flat hollow structure that moves from port to starboard turning on its axis to help steer the ship. A rudder is consist of parts such as; rudder trunk, main rudder blade, movable flap, hinge system, links and rudder carrier bearing. 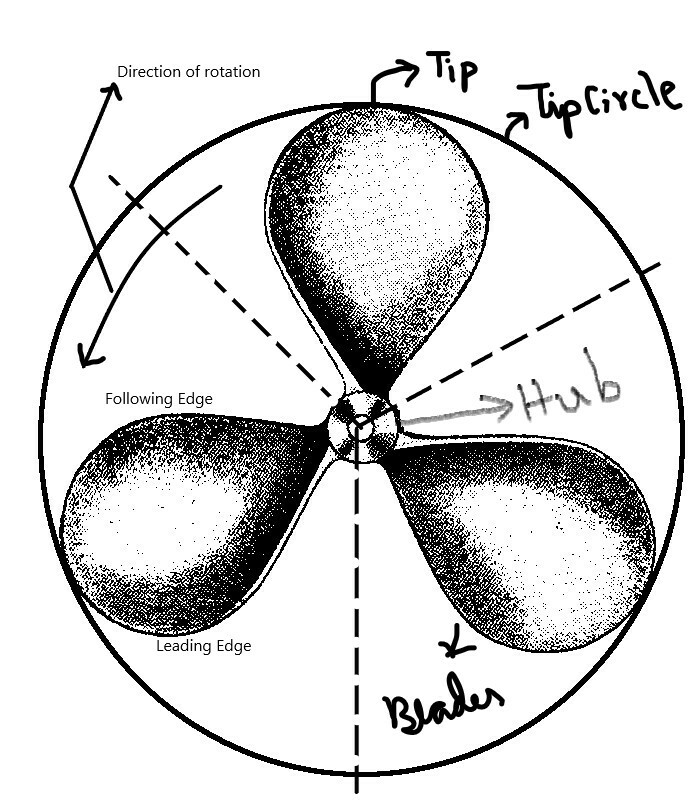 The rudder steers the ship following newtons third law of motion similar to that of propeller. It moves to a direction producing resistance to water flow forcing them to move to the other side. In this very process it produce much needed resultant force for the ship to turn it to the opposite side of the altered water flow. Based on its construction a rudder can be balanced, semi balanced and of unbalanced type. A balanced rudder is the one which have more than 20% of its part forward to its turning axis. Similarly a semi balanced is the one with less than 20% of its part outside or forward to its turning axis; while none for unbalanced rudder type. Function: A rudder is the parts of ship that make it steer. Based on the newtons third law of motion it generates enough resultant force to steer a ship to desired direction. The movement of a rudder is controlled by steering gear system. A rudder must be capable of moving from 35 degree port to 35 degree starboard; with the ability of steering gear to move from 35 degree on one side to 30 degree on another in not more than 28 seconds. 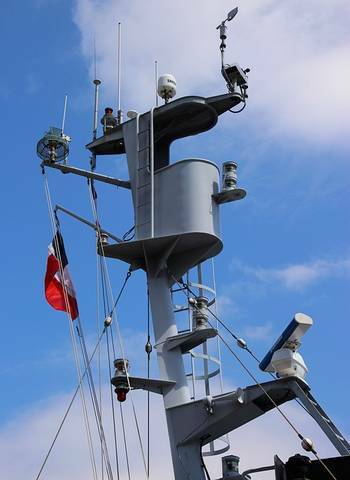 Look For Equipment’s installed – radar receiver, navigation lights and Flag. A mast is a vertical ship structure mounted on top of bridge and forward of the forecastle towards the ships bow. It accounts for the support platform for the ships derrick and hold necessary equipments such as radars, navigation light and ships horn in case of foremast. They are made of high tensile steel with added rigidity based on the size of derricks it holds. Other than that a ships main mast is also used to hoist ships flag. Function: Out of different parts of ship the main job of mast is to hold necessary equipment such as radar receiver, navigation lights, ships horn, flags and derricks in some case. I’d love to know the main function of a marine engineer and how to become a professional marine engineer. While i am currently busy with another next post but would love to explain in details in upcoming posts. But in short you have to get a B.Tech degree in marine engineer from any of the government / flag state approved college or institution. Then you have to get a cdc, passport, STCW courses and other few courses if you want to join tankers and by the time you will be fit for interview in maritime companies to become trainee marine engineer. I will be covering all aspects of it and how to apply in my future post; so stay tuned! This information is very helpful to me. I am a writer, and want to write on a Shipwreck Adventure. I ‘ve just got a very good piece of information that will help me create my desired images. Great ! Good luck with your “Shipwreck Adventures” and thanks for letting us know.